According to Red Bull New York's website, their preseason schedules includes a stop right here in sunny Fort Lauderdale. Apparently they got here yesterday. A scrimmage of sorts is set for Wednesday against the Chicago Fire, but surprisingly enough a Saturday date is slotted against Miami FC. 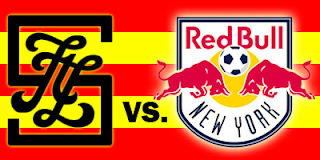 I guess Red Bull New York hasn't gotten the memo yet, we're the Fort Lauderdale Strikers now. Any news on this, who is going, where is it and when do I show up? I'd rather be playing the Cosmos but they don't have a team, just a bunch of celebrities sitting on thrones.